It would be nice if we can Download eBooks Free and take it with us on our devices, as it is not possible to take a book to any place as it may be fat and also includes the weight and we can't get the frequent updates for it. There are many sites where eBooks can be obtained for free, downloaded and can be enjoyed from any Android device. For popular and “new release” reading materials or magazine, an online eStore like Amazon or Barnes and Noble is essential but this sites are not free of cost. So here are some of the websites that gives you free downloadable eBook Specially for Tech Students. It is an online store for free ebook authors, ebook resources, ebook downloads. Besides of it you can also download free magazines from it. Each ebook has its own short review in the description. You can also submit your own ebook, you just need to become a member of the free-ebooks.net to access their library. You can Register it for free. It provides you with free ebooks for your eBook Reader, iPod or PDA. You can browse for any ebook through the most recommendations or recent reviews from visitors or you can even search and download free books in categories like scientific, engineering, programming, which you may feel interesting. There are 23,568sss eBooks available in it and they're all free. It is a unique ebook Publishing house, specialised in free eBook downloads. It also provides an excellent Star rating Showcase for new and evolving authors to come front with their thoughts or ideas. It is very well categorized by topics which is friendly to use, and it also consists of 10 top level categories, and over 125 sub-categories. It is a free website for ebook where users are able to exchange e-books for free and it also gives video training and other materials for educational purposes and also includes self-practise. It consists of thousands of documents like literature, lists, maps, databases, technical references, etc. It provides various links to various ebooks (pdf format) spanning in 9 categories which are used fors daily purposes, they are: Business Ebooks, Gadget Ebooks, Engineering Ebooks, Automotive Ebooks, Health and Medical Ebooks , Hobbies Ebooks, Hardware Ebooks, Sport and Martial Art Ebooks, Programming and Technology Ebooks. It is especially designed to add all this stuffs in your Pocket PC, EPOC, Windows CE, Symbian or other handheld device. 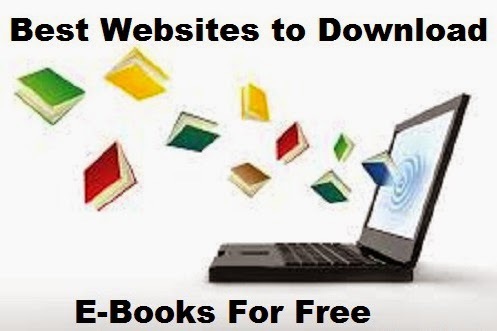 I hope this article will help you to get your desired E-Book that you need, If you know any other Website to Download eBooks for Free, Than please add a Comment.